The Amazing Interstellar Amusement Park is the name of the collection of planets Eggman had captured in the game Sonic Colours. He says that this amusement park is his apology for all his previous misdeeds, but in reality he is only using the amusement park as a cover. His real purpose is to capture the Wisps and harness their Color Powers to power his mind-control laser which he plans on using to capture Sonic's world for his collection. He ties all the planets to Tropical Resort with tractor beam generators, which Sonic must destroy to free the planets from his grasp. 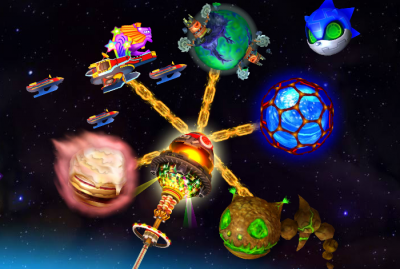 After Sonic defeats Eggman, the planets that made up the park return to their normal locations across the universe, and thus it can be assumed the park is dissolved. Tropical Resort (Wii / DS) - Eggman's artificial hotel worldlet and space elevator anchor. Sweet Mountain (Wii / DS) - A cake-based world with pastry geology. Starlight Carnival (Wii / DS) - An armada of neon ships, presumably of the Doctor's manufacture. Planet Wisp (Wii / DS) - The Wisps' verdant homeworld, supposedly created by Mother Wisp. Aquarium Park (Wii / DS) - An azure, Oriental-themed waterpark world. Asteroid Coaster (Wii / DS) - White-knuckle thrills around a polluted asteroid cluster. Terminal Velocity (Wii / DS) - The space elevator back down to Sonic's world. Game Land (Wii / DS) - The location of the Sonic Simulator for multiplayer. While Planet Wisp is explicitly stated to have been 'captured' by the Doctor for his park, and he obviously built Terminal Velocity himself, it's not entirely clear whether Eggman constructed areas like Sweet Mountain from scratch, or just stole them from elsewhere in the solar system.